A lack of cognitive information or psychomotor ability needed for health restoration, preservation, or health promotion is identified as Knowledge Deficit or Deficient Knowledge. Knowledge plays an influential and significant part of a patient’s life and recovery. It may include any of the three domains: cognitive domain (intellectual activities, problem-solving, and others); affective domain (feelings, attitudes, belief); and psychomotor domain (physical skills or procedures). It is the duty of the nurse to determine with the patient what to teach, when to teach, and how to teach certain matters and concerns on health. Adult learning principles guide the teaching-learning process. Physicians have an important role in patient education. However, physicians are not alone in education patients. This is where nurses get in the manner of offering patient education as a way of providing nursing care to obtain the best outcomes for their patients. Patient education should always be made available in the healthcare setting. A patient is considered most effective when information is accessible whenever it is needed. According to Dorothea Orem’s Self-Care Theory, the goal of nursing was to render the patient capable of meeting self-care needs, a process that often includes patient teaching. Yet, many factors influence patient education, including age, cognitive level, developmental stage, physical limitations, the primary disease process and comorbidities, and sociocultural factors. Certain ethnic and religious groups hold unique beliefs and health practices that must be considered when designing a teaching plan. The following are the common goals and expected outcomes for Deficient Knowledge. Patient explains disease state, recognizes need for medications, and understands treatments. Patient demonstrates how to incorporate new health regimen into lifestyle. Patient exhibits ability to deal with health situation and remain in control of life. Patient shows motivation to learn. Patient lists resources that can be used for more information or support after discharge. Assessment is required in order to recognize patient’s existing knowledge about the present situation. Identify the learner: the patient, family, significant other, or caregiver. Some patients especially older adults or the terminally ill view themselves as dependent on the caregiver, therefore will not allow themselves to be part of the educational process. Assess ability to learn or perform desired health-related care. Cognitive impairments must be recognized so an appropriate teaching plan can be outlined. Assess motivation and willingness of patient to learn. Learning requires energy. Patients must see a need or purpose for learning. They also have the right to refuse educational services. Determine priority of learning needs within the overall care plan. This is to know what needs to be discussed especially if the patient already has a background about the situation. Knowing what to prioritize will help prevent wasting valuable time. Allow the patient to open up about previous experience and health teaching. Older patients often share life experiences to each learning session. They learn best when teaching builds on previous knowledge and experience. Observe and note existing misconceptions regarding material to be taught. Assessment provides an important starting point in education. Knowledge serves to correct faulty ideas. Acknowledge racial/ethnic differences at the onset of care. Acknowledgement of racial/ethnicity issues will enhance communication, establish rapport, and promote treatment outcomes. Identify cultural influences on health teaching. Interventions need to be specific to each patient considering their individual differences and backgrounds. Consider the patient’s learning style, especially if the patient has learned and retained new information in the past. Every individual has his or her learning style, which must be a factor in planning an educational program. Some may prefer written materials over visual materials, while others prefer group sessions over an individual instruction. Matching the learner’s preferred style with the educational method will facilitate success in mastery of knowledge. Determine the patient’s self-efficacy to learn and apply new knowledge. Self-efficacy refers to a person’s confidence in his or her own ability to perform a behavior. A first step in teaching may be to foster increased self-efficacy in the learner’s ability to learn the desired information or skills. Some lifestyle changes. Assess barriers to learning (e.g., perceived change in lifestyle, financial concerns, cultural patterns, lack of acceptance by peers or coworkers). The patient brings to the learning situation a unique personality, established social interaction patterns, cultural norms and values, and environmental influences. 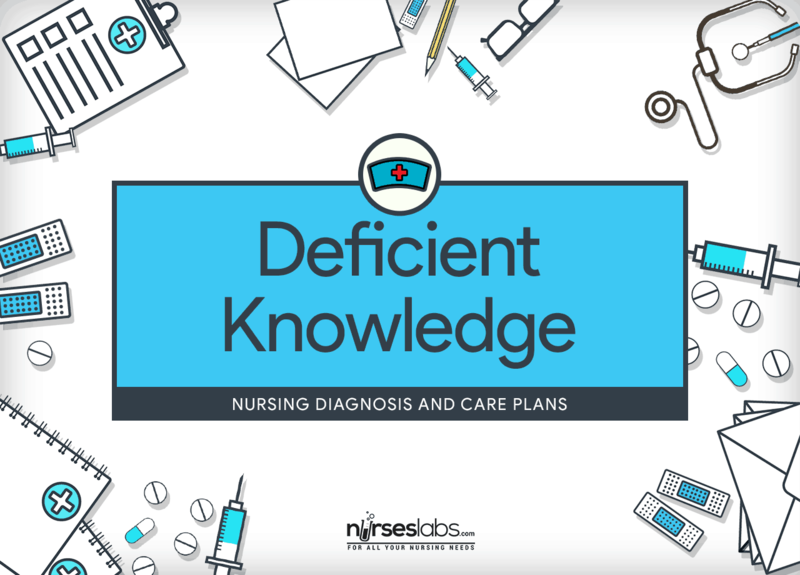 The following are the therapeutic nursing interventions for Deficient Knowledge. Render physical comfort for the patient. Based on Maslow’s theory, basic physiological needs must be addressed before the patient education. Ensuring physical comfort allows the patient to concentrate on what is being discussed or demonstrated. Grant a calm and peaceful environment without interruption. A calm environment allows the patient to concentrate and focus more completely. Provide an atmosphere of respect, openness, trust, and collaboration. Conveying respect is especially important when providing education to patients with different values and beliefs about health and illness. Include the patient in creating the teaching plan, beginning with establishing objectives and goals for learning at the beginning of the session. Goal setting allows the learner to know what will be discussed and expected during the session. Adults tend to focus on here-and-now, problem-centered education. Consider what is important to the patient. Allowing the patient to identify the most significant content to be presented first is the most effective. Involve patient in writing specific outcomes for the teaching session, such as identifying what is most important to learn from their viewpoint and lifestyle. Patient involvement improves compliance with health regimen and makes teaching and learning a partnership. Explore reactions and feelings about changes. Assessment assists the nurse in understanding how the learner may respond to the information and possibly how successful the patient may be with the expected changes. Support self-directed, self-designed learning. Patients know what difficulties will transpire in their own environments, and they must be encouraged to approach learning activities from their priority needs. Help patient in integrating information into daily life. This technique aids the learner make adjustments in daily life that will result in the desired change in behavior. Give adequate time for integration that is in direct conflict with existing values or beliefs. Informatiom that is in direct conflict with what is already held to be true forces a reevaluation of the old material and is thus integrated more slowly. Provide clear, thorough, and understandable explanations and demonstrations. Patients are better able to ask questions when they have basic information about what to expect. Give information with the use of media. Use visual aids like diagrams, pictures, videotapes, audiotapes, and interactive Internet websites, such as Nurseslabs. Different people take in information in different ways. Check the availability of supplies and equipment. Adequate preparation is especially important when teaching in the home setting. When presenting a material, start with the basics or familiar, simple, and concrete information to less familiar, complex ones. This method allows the patient to understand new material in relation to familiar material. Focus teaching sessions on a single concept or idea. Clearly focuses teaching allows the learner to concentrate more completely on material being discussed. Pace the instruction and keep sessions short. Learning requires energy, so shorter, well-paced sessions reduce fatigue and allow the patient to absorb more completely. When teaching, build on patient’s literacy skills. In patients with low literacy skills, materials should be short and have culturally sensitive illustrations. Identify patient’s understanding of common medical terminology, such as “empty stomach,” “emesis,” and “palpation.” Patients are expected to read and understand labels on medicine containers, appointment slips, and informed consents. The nurse gives information in a caring manner, using plain language. Ask the patient to explain in his or her own words. Rephrase the information if unable to repeat it accurately. Again ask the patient to teach-back the information using his or her own words until the nurse is comfortable that is understood. If the patient still does not understand, consider other strategies. The teach-back technique consists of specific steps in a repetitive order to evaluate the recipient’s knowledge of the content discussed. Patients who are not able to do this method after multiple cycles is considered cognitively impaired. Provide preadmission self-instruction materials to prepare patient for postoperative exercises. Providing patients with preadmission information about exercises has been shown to increase positive feelings and the ability to perform prescribed exercises. Encourage questions Questions facilitate open communication between patient and health care professionals and allow verification of understanding of given information. Provide immediate feedback on performance. Immediate feedback allows the learner to make corrections rather than practicing the skill wrongly. Allow repetition of the information or skill. Repeated practice allows patient gain confidence in self-care ability. Render positive, constructive reinforcement of learning A positive approach by the patient will help him or her feel good about learning accomplishments, gain confidence, and maintain self-esteem. Incorporate rewards into learning process. Rewards help to make learning fun and exciting. Note progress of teaching and learning. Documentation allows additional teaching to be based on what the learner has completed. Help patient identify community resources for continuing information and support. Learning occurs through imitation, so persons who are currently involved in lifestyle changes can help the learner anticipate adjustment issues. Community resources can offer financial and educational support.